Live Boolean: For all their power, Boolean systems have historically required a lot of trial and er­ror before finally getting a satisfying result. With Live Boolean, artists gain the ability to combine multiple sculptures together and see in real-time what the resulting mesh will look like. Any model can be subtracted from another, regardless of their polygon counts. You can even use Live Boolean with the existing instancing systems in ZBrush such as NanoMesh and ArrayMesh. While Live Boolean is active, you can even sculpt on your models while previewing the Boolean results. All of these options can be combined together to provide new sculpting workflows that are unique to ZBrush. Vector Displacement Mesh: Expand your Alpha arsenal with a new library of Vector Displacement Meshes (VDM). These are 3D sculpts used as brush building blocks that will allow undercutting when drawing on a model’s surface. As an example, you can draw a nose complete with nostrils in a single brush stroke. Or an ear with complete front and back sides. Or a bent finger, scales with a raised angle or even an open mouth. All of this without lost depth or detail. Gizmo 3D: The Gizmo 3D provides the artist with a new, simple UI element that will allow sculpts to be manipulated and transformed with precise control. Gizmo 3D can be eas­ily placed at any location or orientation to perform accurate transformations. You can instantly change the pivot point for Move, Scale, or Rotation. There are options to rotate relative to the surface normal or world axis and much more. The new Gizmo 3D transformation tool will allow multi-selection and manipulation of SubTools. Select as many SubTools as you want, then move, scale, and/or rotate them as a unit. This makes it even easier to pose hard surface models! ZBrush4R8 takes making large, broad adjustments to any sculpt easy with the new deformation modifiers. Bend text around a curved surface with the classic Bend on Curve modifier. Twist a sculpt along any axis. Use the Free Form Deformation box (FFD) to completely adjust the silhouette for any model. Also included are the unique, powerful deformers like Extender and Multi-Slice. Design rapidly with simple geometric shapes. Artists can freely adjust the geometry that defines the shape, even after the shape has been applied to the surface. Convert a smooth cylinder to an octagon, adjust a sphere to have flat poles or change a cone into a pyramid – all in real-time. Using this system, a few primitives can be turned into a whole library of sculptable shapes. Alpha 3D: Convert any sculpture or shape into a 2D alpha with the click of a button. Once the shape or sculpture has been captured, you can reposition, adjust, or even rotate the alpha to any axis. It’s a fast and interactive way to create uniquely different alphas for surface sculpting. Similar to the Insert Multi Mesh (IMM) brushes, the new Multi Vector Displacement Mesh system allows you to build custom brushes with a variety of vector displacement meshes and switch between them on the fly. Not only can a brush chisel into the surface to create overhangs, complex objects can be drawn – complete with back surfaces – in a single brush stroke. Imagine being able to texture a dragon with overlapping scales, or draw a fully formed ear without need­ing to re-sculpt it for every model. Lazy Mouse 2.0: Our Lazy Mouse system was designed to draw with smooth, precisely controlled strokes. Now an artist can guide any stroke’s angle and length before applying the result to the surface. You can even keep a stroke on a consistent elevation level with no buildup when the stroke path crosses back over itself. Ever want to apply a pattern continuously around a sculpt without any break in the design? The new LazySnap addition to Lazy Mouse makes it possible to start a stroke, stop to rotate the model, then continue the brush stroke from where you left off without breaking any pattern associated with the brush. 3D Text and Shape Creator: ZBrush 4R8 comes with a complete generator for creating 3D text in real-time. This makes it possible to create individual words or small phrase in 3D. You can also use an SVG file to create your own custom logo for placement on any surface. Combined with the new Live Boolean system, this 3D text creator is an easy way to engrave or emboss your surfaces with text. Thanks to the new deformers you also have powerful ways to adjust the text or even change the silhouette of your logo. 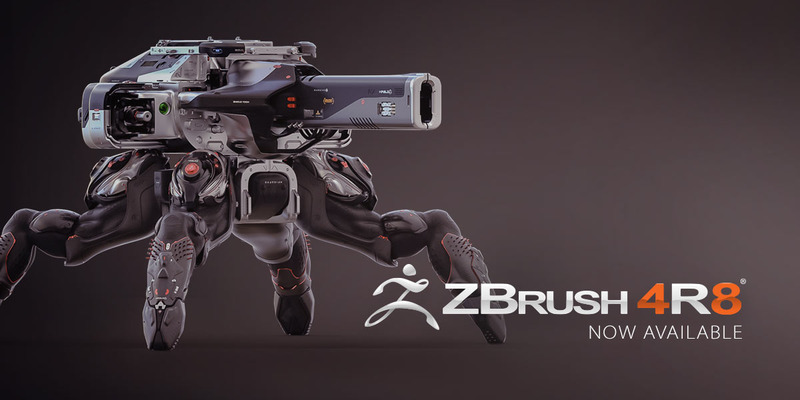 Multiple Language Support: ZBrush 4R8 is now available in several languages: English, Chinese (Simplified), French, German, Japanese, Korean, and Spanish. You can switch from one language to another at any time. Beyond the officially supported languages, it is even possible to create your own custom translation which can be shared with others. While the ZBrush interface has been translated into these languages, customer support from Pixologic remains English, only.